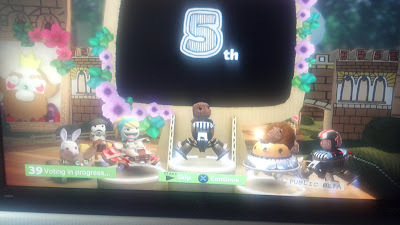 I got into the public beta of Little Big Planet Karting this week. It's a kart racing game set in the Little Big Planet universe. Racers compete against each other by driving karts on themed tracks. The primary goal is to come in first, with the secondary goal being to grab special content in order to customize your racer, kart or headquarters. Comparisons to Mario Kart are going to be inevitable, but, so far, LBP Karting blows that game away. And it's nice to finally have a kart racing game on the PS3. The biggest draw to LBP Karting is the user-generated content. Unlike Mario Kart Wii, LBP Karting allows players to make their own custom levels and share them with the rest of the world. When creating a track in the level editor, players have the ability to customize the track as well as weapons and the rules of the race. Racing against other players online has been a breeze and has been a lot of fun, but I'm hoping that LBP Karting will offer split-screen racing for off-line multiplayer. So far, I've had a great time playing Little Big Planet Karting, and I'm pretty confident that, once it gets out of Beta testing, it's going to be an awesome game.